The SKODA Citigo is the most youthful model in Skoda’s range and is sure to be a big success due to its low running costs, excellent refinement and by being great fun to drive. This is the first three-door model Skoda has produced in its 117-year history and will feature a new cleaner designed black and chrome Skoda badge, giving Skoda a totally new corporate image. Citigo also defines the entry of GreenTech models which come with the famous start/stop technology that Skoda claims lowers the rate of fuel consumption, generous brake energy recuperation and low resistance tyres. 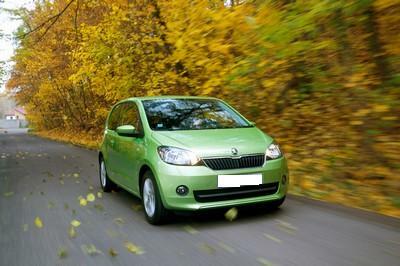 The Citigo, a first car choice for many drivers, is also likely to win over younger buyers. It’s stylish and functional with a place for drinks bottles, a mobile phone slot which sits in the cup holder and even a clip on the dashboard to hold a photo or map. For a small car, the boot is exceptionally large too, making it ideal for shopping trips and weekends away. Parking is easy, thanks to light steering, a short nose and vertical tailgate and the Citigo scores a well-deserved five stars when it comes to running costs thanks to a petrol engine which emits 96g/km of CO2 and averages 68.9mpg. Insurance groups are expected to be amongst the lowest available. The Citigo boasts impressive safety for its size with four airbags as standard, two front and two head and thorax bags, giving it a five-star Euro NCAP rating. The Citigo also features an optional City Safe Drive feature, which can automatically perform an emergency stop if an imminent collision is detected. There will be a choice of trim levels. With the SE we should see features such as alloys, air-con and central locking. Expect the Elegance to come equipped with enhanced interior and exterior trim, front fog lights and an uprated stereo. This quality little Skoda Citigo might not be the most desirable of vehicles but it’s the most practical and best value. It is compact yet roomy with a surprisingly generous interior space and will be available in three and five-door versions. An ideal fuel efficient little car both in and out of the city.